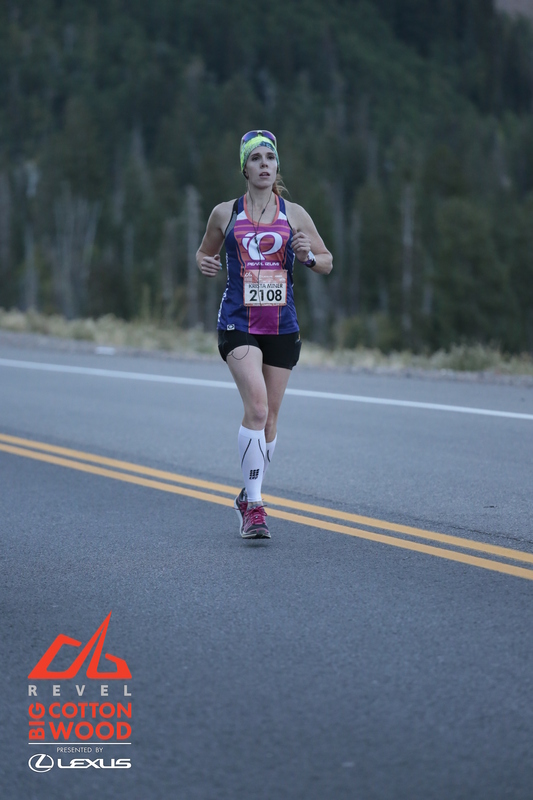 When I first started to train for the Boston Marathon and work on increasing my speed, I suffered from a couple different bouts of tendonitis. The first thing the physical therapist did was check my balance when I was standing on one foot and then the other. It was pretty comical to see how that simple act was difficult for me. Ask me to do that today and you will see a completely different result. Ask me when I had tendonitis issues last and I would answer over a year ago. Working on improving my balance has helped me avoid injury and has improved my running performance. Earlier this year, a study released by Reuters Health made a bold new statement: “Strength training and balance exercises are more likely to help prevent sports injuries than stretching.” While this new evidence does not call into question the importance of stretching when exercising, it places new emphasis on a type of strength training that many are not participating in. Learning how balance exercises can prevent injury, and what exercises are recommended, can help you avoid serious injuries and enjoy healthy activity levels. Balance is your capacity to sustain your center of gravity over your base of support. Most don’t spend much time thinking about their balance until their balance is called into question. But you don’t need to let a good fall or injury awaken you to your body’s unmet needs. Balance training is an important part of active and non-active lifestyles. If you are one that hasn’t given much thought to balance training start now. Attention to balance and strengthening your core lead to improved posture, a decrease in back pain and performance improvement during physical activity. Furthermore, having a good sense of balance is a crucial skill for avoiding injury. If you have developed this skill, your mind and body will be able to make the fast adjustments necessary to avoid falling or to reduce damage from the impact of an unpreventable fall. A 2013 study published in the British Medical Journal showed that out of 17 clinical trials involving more than 4,300 participants over the age of 60, those that had incorporated balance exercises each day had a 37 percent reduced risk of injuries from falling and a 61 percent lower risk of breaking a bone from falling, in comparison with those who hadn’t attempted the balancing exercises. Accelerated reaction times.This aids in reducing the impact of a fall by causing you to put out an arm or grab something secure. Increased brain activity.Consistent exercise keeps the brain active and alert decreasing your risk for falls. Enhanced coordination.This benefit prevents falls but also can help you react with better agility when you fall. Increased muscle mass.Building muscles provides protection around bones and joints and can help soften a hard fall. Healthier bones.Resistance exercises bolster bone tissue and make bones more able to avoid breaks. Falling as a child was a common occurrence that rarely resulted in serious injury, but falling as an older adult is another story entirely which often results in broken bones and impaired mobility. A Harvard Health publication estimates that at least one out of three people over age 65 fall each year. These falls are often associated with things that affect the sense of balance. Inner ear disorders which can cause dizziness, neuropathy, deteriorating eyesight, and muscles that don’t respond as quickly as they did years before all affect your sense of balance. Limited mobility can lead to an onslaught of other health struggles that are often difficult to recover from. These injuries and challenges have psychological consequences as well as the victim begins to doubt their mobility, experiences fears of falling, and develops a growing sense of dependence on others. Committing to improve your balance through weekly exercise means taking a big step forward in your current and future wellness. When beginning, choose simple exercises that don’t rely on individual strength or endurance. Almost any activity can be adjusted to improve your balance. Stand on one foot.Stand on one foot for a count of 10 to 20 seconds a few times a day. This is a simple exercise you can do just about anywhere at any time. Stand up with no hand support. Stand from a seated position without using your hands to balance yourself. Try sitting without using your hands as well. Put your socks on while standing.Try putting your socks on while standing up. Lean against a bed so if you lose your balance, you’ll land on something soft. Walk a line. Practice walking in a straight line–heel to toe, heel to toe. Do one-legged squats.Bend one leg and dip down into a squat while balancing on the other leg. Do this ten times then switch legs. Make sure and take the time to incorporate balance training into your weekly training workouts–you will be grateful you did! 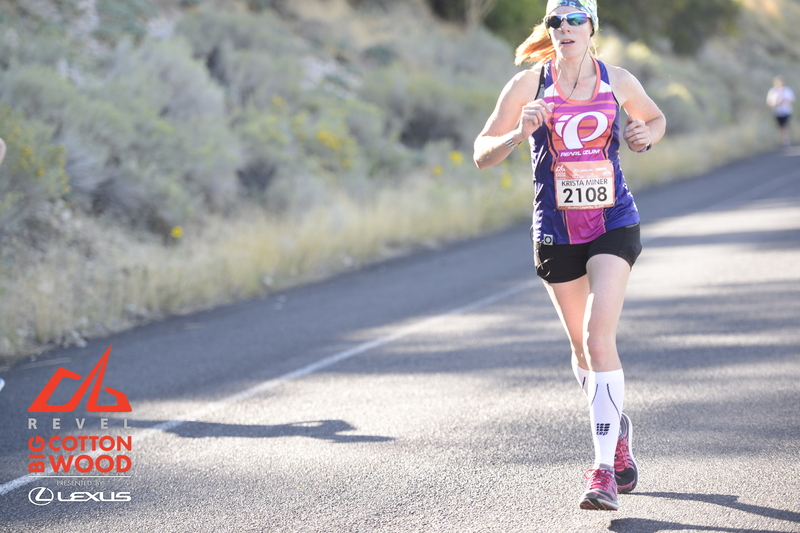 REVEL Shot of me running on the Big Cottonwood Marathon course. 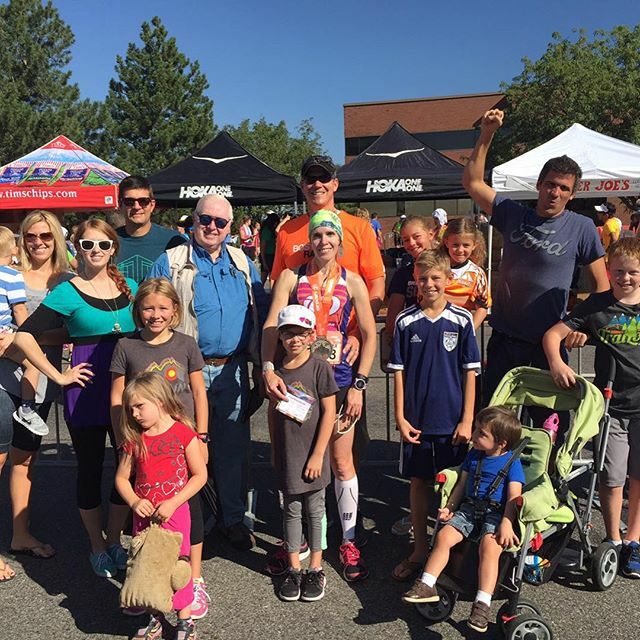 I ran the Big Cottonwood Marathon on September 12th and had such a positive experience. (If you haven’t participated yet in a REVEL race, you really need to search one out and do it!) For those of you who have been following me on this blog, you know that I ran this same course last year with my dear friend, Natalie Brown. 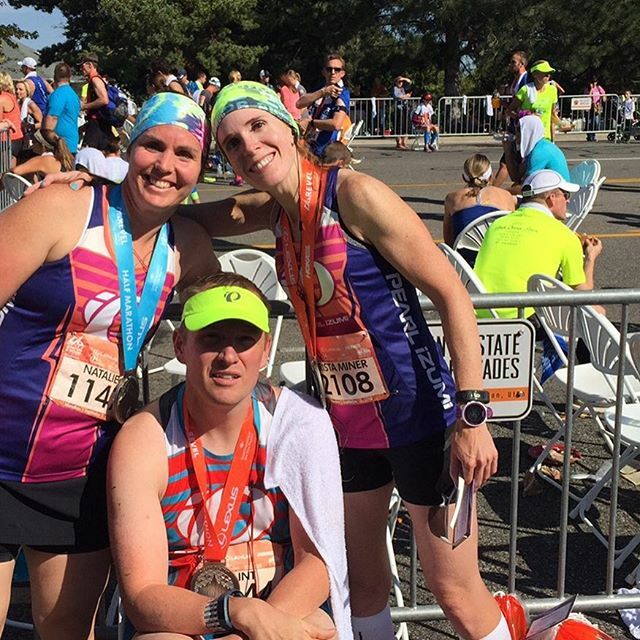 Last year’s experience on the course was heartbreaking when my friend missed her goal to BQ by mere seconds. This year, I was determined to rewrite the story. Because I had just run a marathon a couple months before, my training for the Big Cottonwood Marathon had been in progress for months. However, I made three changes for this race: 1) I calculated my ideal racing weight and made the goal to run at it; 2) I altered the way I carb-loaded so that I wouldn’t feel so weighed down on race morning; and 3) I decided to run this marathon faster with the goal to finish the race under 3:20–I thought it would be fun to be able to register for Boston on the first day of registration by being 20 minutes under my 3:40 qualifications standard. I was really excited to run this marathon for several reasons. The course is fast and scenic–all those fall colors changing are great mood enhancers while you are working your body hard! I also had several friends running this race that came down with me from Colorado. And, as I mentioned before, I REALLY wanted to leave this course with a happier ending than last year. After carb-loading at the Lindon Pizza Factory with a large group of my family that live in town and my friends, we headed to the expo at the South Town Expo Center in Sandy. 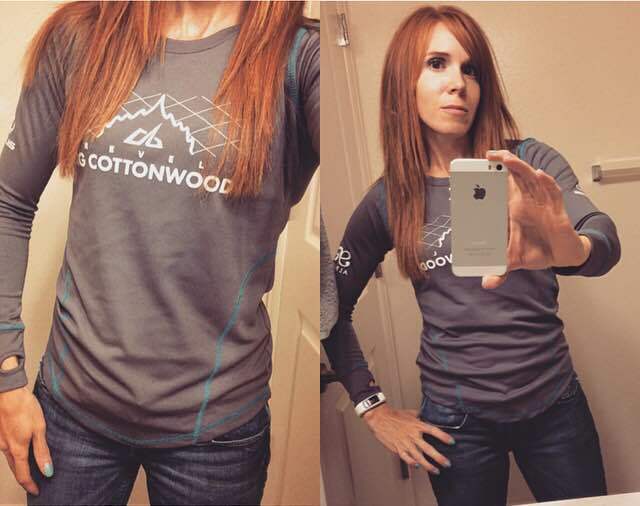 2015 Big Cottonwood Marathon Race Shirt–Love it! We were really excited with the REVEL race shirts this year and excited to take our gear bags and get checked into our hotel after a long day of driving. 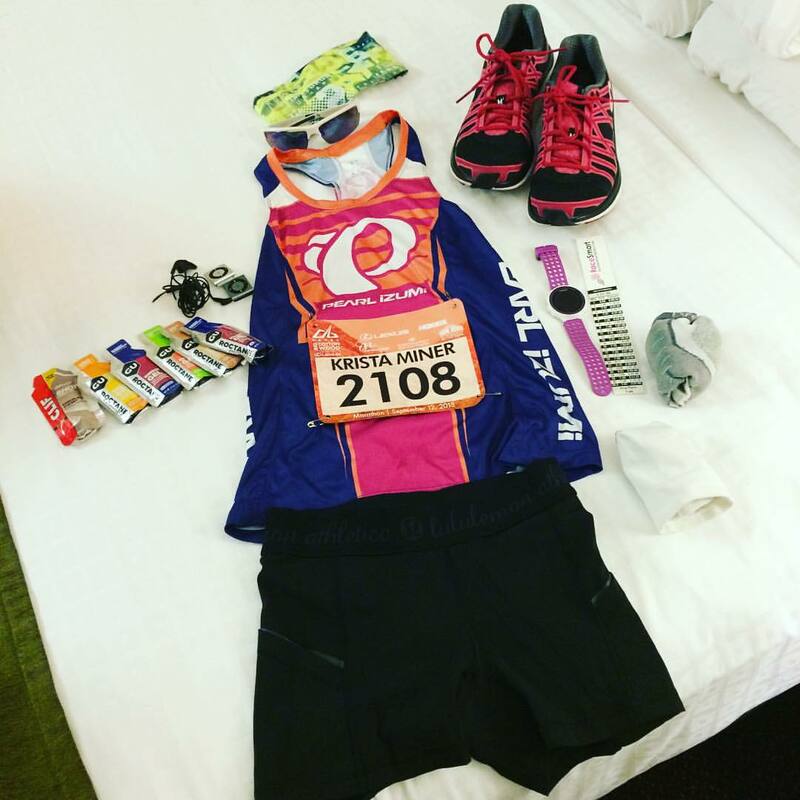 Laying out my race attire and tools the night before the Big Cottonwood marathon. We stayed in one of the race-affiliated hotels–the Crystal Inn Hotel–and were pleased with our accommodations and the breakfast they provided for us. They also had a bus for us (that we met at 4:30 in the morning to take us to the race start.) We got our clothing all laid out and hit the sack quickly since we were waking at 3:00 am to eat our breakfast and prepare! We woke up a little before three and had our breakfast (oatmeal with peanut butter and a bagel.) We walked down to get on the bus and had to part ways with Natalie–she was running the half distance this year because of a knee injury. I was really sad not to be able to run with Natalie this year, but she is running Boston in April with us and needed to keep that body healthy!! The Scene on Guardsman Pass at the Big Cottonwood Marathon. Clint and I rode up to the marathon start together and exited the bus into what looked like a scene from Close Encounters of the Third Kind. There were bright, white lights illuminating a sea of runners all clad in sliver space blankets sitting under a sky full of stars in the middle of a grove of pine trees. 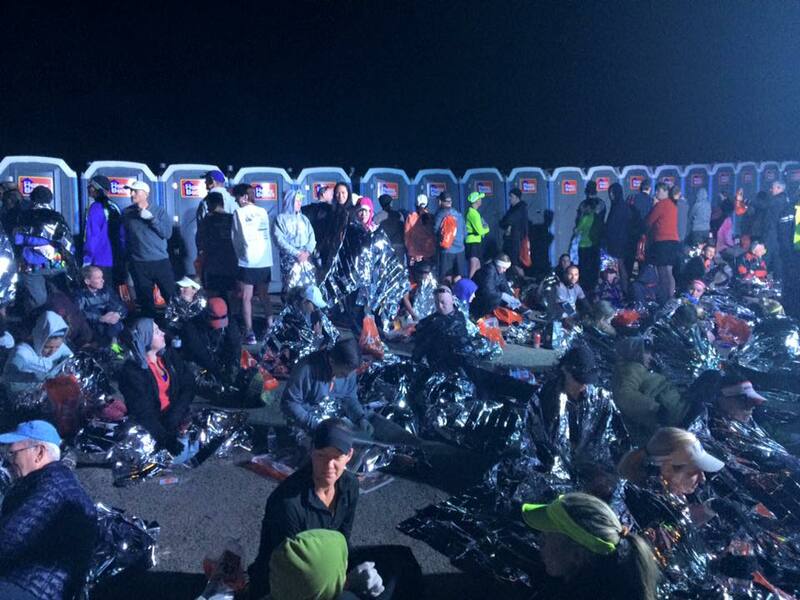 Not to be missed, of course, was the long row of porta potties directly behind all the racers. REVEL did a great job of taking care of us before the race start. They had gatorade and water stations, fruit, space blankets, plenty of porta potties, and frequent announcements on what time it was and what was going on and when. The temperatures that morning on Guardsman Pass weren’t bad–about 50 degrees. I was prepared for at least ten degrees cooler. I had two space blankets, gloves, my down coat, pants, a top….etc. I was warm. I loathe being cold. I was surprisingly calm race morning despite my nerves. I had done zero hill training and was a little concerned in how this would work against me in the mile-elevation drop from the beginning of the course at 9700 feet to the end of the course at 4400. I found a place to lay down and just tried to relax and take in the beauty of the stars and the energy around me. So, about 30 minutes before race start, you will typically find me cycling through the porta potty line. Pretty much everyone does this. You get in line, use the facilities, then get back in line because by the time you get to the front again you will need to go again. You have to start a marathon well-hydrated and nerves also play a part. (I don’t stop to use the bathroom once I start the race.) Unfortunately, in one of my cycles through the line, I picked a line where the guy in front of me decided to camp out in the potty and I actually missed the start of the race! This kind of stressed me out. I was way in the back of the group of racers. Luckily, I knew that my starting time for the race would be based on my chip time which began when I crossed the start line. But even with this knowledge, I didn’t want to have a huge discrepancy between my gun time and chip time and confuse my family that was waiting for me at the end who knew my goals. I also didn’t want to risk the chip failing and having to rely on an inaccurate gun time. Starting at the back of the pack was also challenging because my goal pace for the first mile was a 6:54 and at the back no one was running with this pace in mind. Trying to get around people to run the pace I wanted was extremely challenging. In hindsight, I really should have just left the porta potty line so I wouldn’t miss the start, but I just had this fear that I would have to use it on the course and lose valuable time….By some miracle, I was able to weave myself out of the pack and kept my first-mile pace goal. Coming down from Guardsman Pass. One of the greatest realizations a few miles in, was that my legs felt strong. At this point at my race in July, my legs had not felt strong like this due to illness the day before the race. 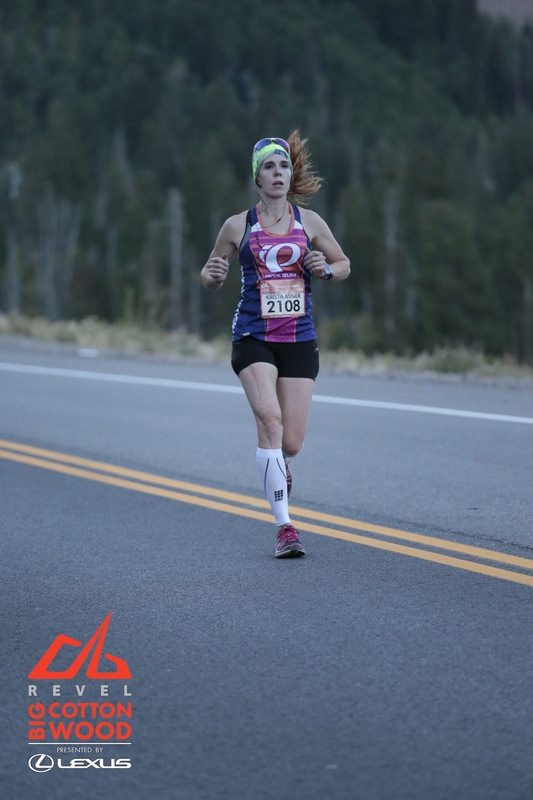 Feeling the difference encouraged me and pushed me forward in my race goals. I had a pace band for 3:21, but I really wanted to go sub 3:20 so I started subtracting 6 seconds off of what my pace band said I needed to run per mile and hoped that my body would keep up with my heart! I spent time enjoying the course during this half of the race. It was just so beautiful to see fall blooming up in the canyon. One change this year in the course was Mile 4. To shorten the out-and-back section from miles 20-23, they added a loop up at the top. This loop included a significant hill. I would rather have had a longer out-and-back than a hill at Mile 4, but it all worked out in the end. But, prepare yourself to slow down at Mile 4 so you don’t burn through too much of your reserve in the beginning of the race. Those legs working hard for me! Okay, so since I hadn’t done any hill training, I was actually glad when I saw the mile 18 sign because I knew that we were heading out of the canyon soon and I felt like my body needed a break from all the downhill. I wasn’t hurting–which I mostly attribute to shedding some pounds before this race–but I could tell I needed to work some different muscles in my legs for a while. So, I’m not going to sugarcoat it. This part of the race is challenging. You have just worked your quads over miles of downhill and then you hit some uphill and it will challenge you. You just have to mentally prepare for it. My pace band slowed me down in this section and I was glad for it! I banked some time on the downhill sections in the canyon before this section so I could afford to slow down. But, mentally, this part of the race had me worried that I wasn’t going to meet my goal. I had slowed significantly and was mentally having to really push myself to keep on going. I could see the turn ahead of me that signaled I had finished the out-and-back portion of the race and I just kept my eyes fixed on it as best as I could. Once I hit mile 24, life was good again. This course has the best last two miles of any course I have run (except maybe Boston.) It is just a straight, descending, spectator-filled road all the way down to the finish. The slight downhill helped me get my legs moving back to a competitive speed again and lifted my spirits. And then, and then I could see the finish line and all I could think about was my family and friends at the finish and how badly I wanted to finish strong and meet my goal. Big Cottonwood Marathon Picture by REVEL of me Approaching the Finish Line. When I crossed the finish line I was immediately met by my friend Natalie who was there helping Clint who had finished about ten minutes before me (and qualified for Boston for the third time!!). I had to keep my legs moving so I couldn’t stop to talk to her, but welcomed a big hug! Family and Friends who were at the finish line waiting for me. My husband found me and congratulated me and then congratulated me even more when he realized that I had actually turned in a time under 3:20! (I explained to him that I had started late at the top). He has only been able to be at two of the finish lines of my six marathons so it was really great to see him there. One of my favorite things about racing is seeing his reaction when I finish–he has a way of making me feel like a superstar. And my kids! They hang on to me and follow me everywhere I go like I won first place no matter what place I actually received. They are some of my biggest cheerleaders. I hope I am inspiring them to go for their dreams–big and small and to never, ever give up. After I saw my family and friends, I headed over to the table to get my official time card. 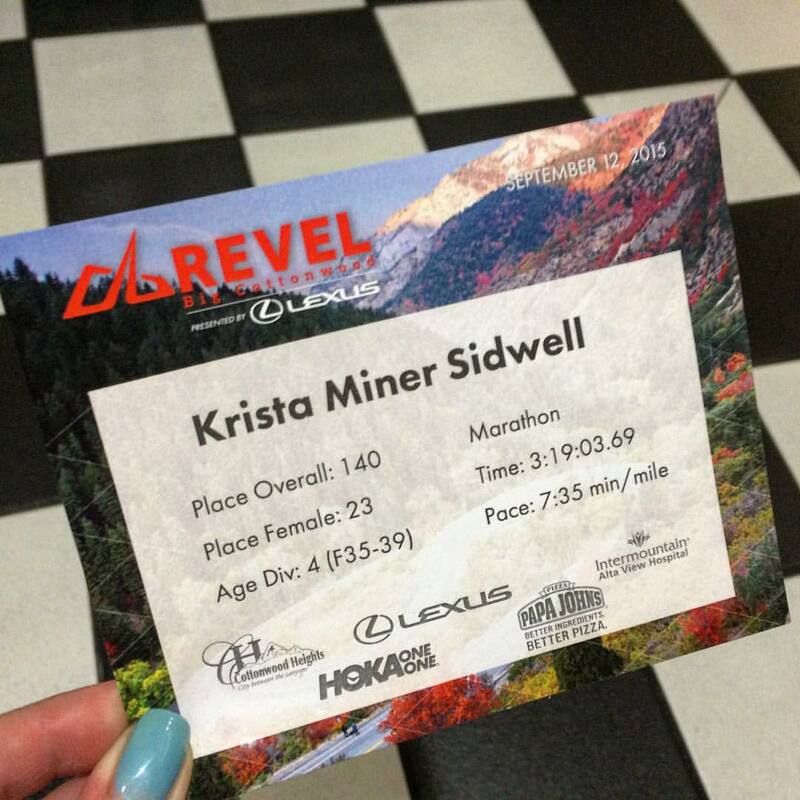 The lady entered my bib number and then said (very dramatically): “Oh, you just missed it! 4th in your age group….” (If you get 1st-3rd in your age group you get an additional medal and sometimes prize money). Honestly though, I was happy with my finish time so I didn’t feel that badly that I didn’t place in the top three. 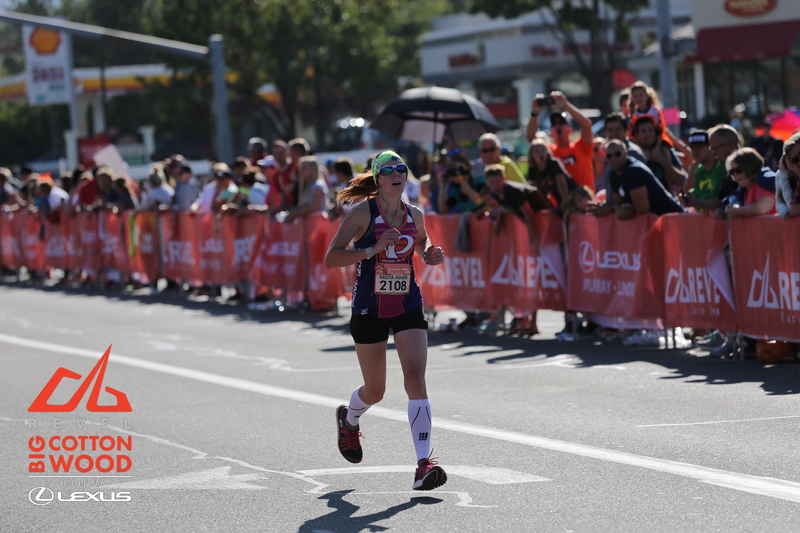 The ladies that were the top three finishers were 3:04, 3:03, and 3:02 times…. Here are what my splits looked like from this race. You can tell where the hills were! Race weight really does matter. Being about four pounds lighter on this course than I have been on previous courses made this race so much more enjoyable. Upper body strength pays off. I really focused on letting my upper body carry my lower body so that I could lessen the impact on my joints. I’ve been working on this in training and on engaging my core and glutes more. It really helps lessen all the work your lower half has to do when your upper body is doing its part. When you feel strong, go for it. Trust your instincts. I could have been conservative and stuck with my the 3:21 split times on my pace band, but my mind and my heart were telling me that I could give more and I am glad I listened to them. Never give up. Even if you start to slow down and you start to think there is no way you are going to achieve your time goals, don’t stop. Just keep doing the best you can. More likely than not, you are on a slight hill that you can’t see but that your body can feel and that is what is slowing you down. It will pass. Just keep moving. Don’t over carb-load before a race. If you are eating to the point of feeling too full each day, you are overdoing it. Carb-load 2-3 days before, so you can top off the glycogen in your muscles but don’t overdo it! Right after a marathon I rarely feel like eating, but give me a couple hours and I am ready to go! We have the tradition of going for burgers and fries as a post-marathon lunch. In-and-Out never tastes so great! So, after an hour or so getting cleaned up at the hotel and checking out, we hit the streets for some burgers and a stop at the Sweet Tooth Fairy for a delicious chocolate chip cookie for later–also a tradition–then I spent the rest of the day with my family, the kids and their cousins. I refueled that evening at Tucanos Brazilian Grill in Orem, Utah. (I was craving some red meat!) I won’t soon forget this time with my family chatting about life, the race, goals, dreams and basking in all the extra endorphins running through my system. I love race days. I love the whole day (especially since the lactic acid doesn’t really set in until day 2 for me….) This race day was especially sweet because I got to spend so much of it with my family and because I met my goals. Thanks, REVEL for another great, professional race! 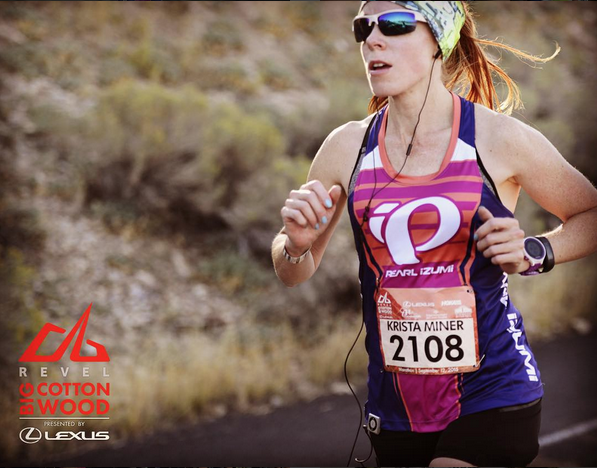 We’ll see you in a few weeks in LA at the Canyon City Marathon! Water at every aid station. Yes, I stop and walk so that I get all the water down. Gatorade at aid stations that are at least 30 minutes after I have taken a gel or before I will take another gel.